Oh no, sound not working on iPhone 6. More of the people have a query on voice call quality on iPhone 6 and iPhone 6 plus. Have you also affected this Problem? People who changed old iPhone 5S/ 5/ 4S to iPhone 6 or iPhone 6 Plus, iPhone 7, 7 Plus facing low volume experience on iPhone. Here is the hidden solution on your queries likes “ Increase call volume in iPhone 6 ”, “Fix low call volume in iPhone 6”, ”Boost call volume iPhone”, ”iPhone 6 low call volume fix”, ”Increase call history iPhone 5s”, ”Solve low volume experience on iPhone”, “Remove iPhone 6 external noise”. Also fix This problem: Improve iOS Battery Life. So most of the people are using headphone, headset and enable speakerphone whenever call receive on iPhone 6/ 6 Plus, 7/ 7 Plus. 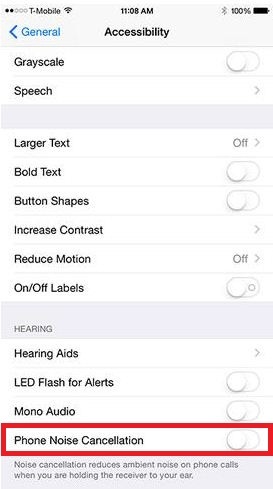 Thanks to apple giving amazing accessibility features on iOS 8. And Continue in iOS 10, iOS 11, iOS 12. Step 2: Under the setting option screen, Tap on General. Step 3: Under the wide option related to accessibility, Tap on Accessibility. Step 4: Disable/ turn off Phone Noise Cancellation. This will ignore all interrupt coming from your iPhone, for Increase call volume in iPhone 6 and 6+. 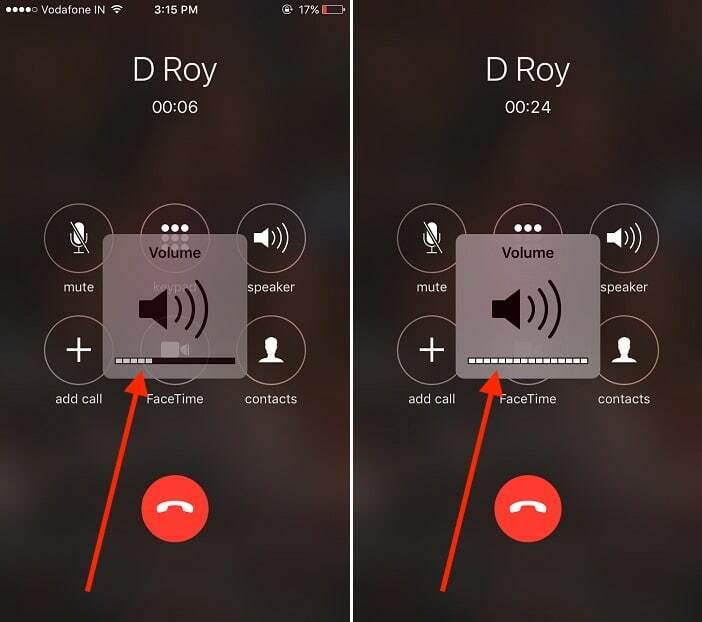 Can’t hear incoming call sound on your iPhone, Check level up while you are talking on iPhone. Turn up the volume button to the maximum level. 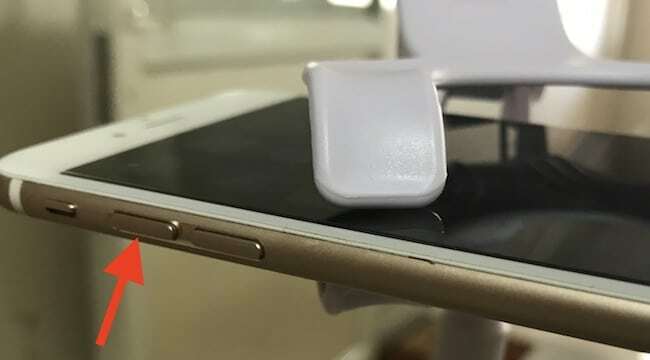 This Tricks also works for iPhone connected during a call with Earpiece/Apple EarPods Lightning connector or Airpods. New iPhone series iPhone 6S/ 6S Plus, iPhone 7 and 7 Plus has the same design and Input button placement. Test the sound quality, isn’t any changes then move on the next step. Should I Go with Speaker mode: Real-time you are getting issues with low sound for an incoming call and Quick Fix, You can use Speaker option on Caller screen [See Above Picture]. In spare time you can fix microphone speaker using these steps. Make Call Louder and Set to decrease with the side button, So no one around you can listen when you are in public place. 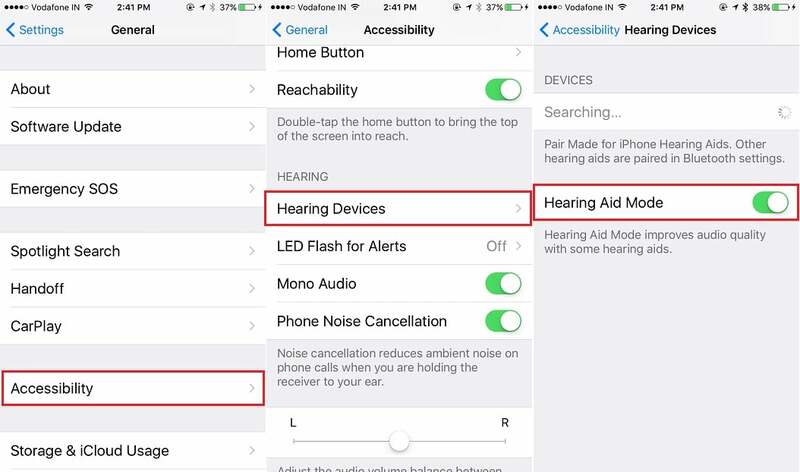 To Change earpiece volume, Go to the Settings > Accessibility > Hearing Device > Hearing Aid mode > ON. 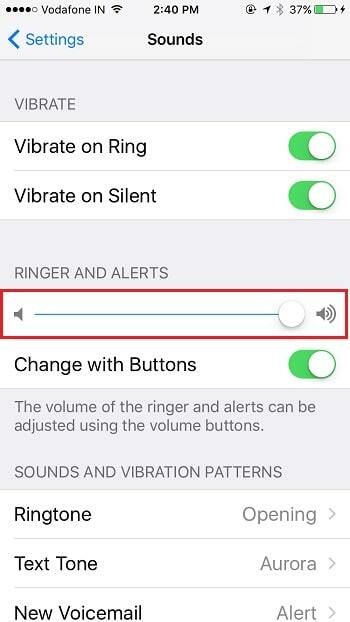 Other settings for Volume that help to increase ringer & Alerts volume or Media/ Apple music volume on speaker. Using physical Volume button: From your iPhone Home screen only, Change volume level. Go to the Settings > Sounds > Ringer and Alerts. Slide finder right to Level up sound bar and volume as well. Going out with, after a few months and years, you can notice the extra layer of the dust cover up speaker holes with clammy dust particles. Use, Soft kids toothbrush that removes dust from too many small holes on speaker, Wooden stick or repair kit tools (if you have), alternatively you can use for clean iPhone’s outer speaker port. Are you an expert in repair? You can clean it inside after completely open. iPhone users like to use your iPhone with a Temporary cover. That prevents from scratches on screen. But You should remove it. Because This plastic cover the Hearing speaker of your iPhone and it’s not visible usually. Are you using Screen Card as an iPhone’s glass protector? Double check this thing. Still not any help, Contact apple support or technical team. In case are you failed after followed above steps accurately, Apple will help you? That causes some hardware problem giving low call sound volume from your iPhone 6 and iPhone 6 plus, send for replacement at the nearest store. In case you know that mono audio also helps to improve or increase sound quality with better understanding. Get the whole idea on mono audio, refer my helping tutorial and turn on it. Are you using older iPhone version and installed iOS 8, then don’t miss out to check this option correctly. Great option for the guys who talk remotely without iPhone keep on ear mostly while driving or on Working time. Best Airpods Alternatives. Also Read: Fix Bluetooth Call Volume Too Low on iPhone. Don’t miss sharing your experience on Increase call volume in iPhone 6 and iPhone 6 plus using the above solution. Going to settings, turning off the Reduce ambient noise setting worked for me. Thx! I have done all this and I still need it louder. Sharon if u did all that and u still need louder tha you need some QTips to clean your ears out. My iphone 6s raise volume button is not working, anyone suggest me the solution. I tried to clean it but didn’t help and when I visit service center, directly they said, motherboard needs to be replaced. Bought an used Iphone 6+ . When I receive a call the phone only vibrate but no call sound at all. Is somthing wrong in settings (tried everything) or there is a defect ? If somone can help , thank you . 3. Check the ringtone is set correctly, Go to the Settings > Sounds & Haptics > Ringtone > Select Ringtone. 4. Finally, You can go with reset all the settings. Go to the Settings > General > Reset > Reset All Settings. I ended up taking my iPhone apart and cleaning out the little speaker with some q tips. A little bit of dirt came off the speaker but it made a huge difference. Before taking your phone apart try just cleaning the outside of the speaker. Sometimes it helps too. i have just recently bought an iPhone 6 and the volume is very low even tho it’s at its highest my daughter has an iPhone 6 as well and her volume is way higher than mine can get can someone help me? Carefully Read My Tips! especially New iPhone user Forgot to remove Plastic cover from iPhone body.